A small right-wing minority, the populist Yellow Jackets are fighting an uphill battle against a government and nation that is as far left and socialist as any in Europe. While opening their arms, borders, and social welfare services to unlimited numbers of Muslim migrants from Africa and the Middle East, France, like most of Europe, is struggling to take care of all them all. By all appearances, the majority of bleeding-heart liberal French voters are perfectly willing to see their culture, their security, and their nation disappear for the sake of political correctness, lest anyone should call them racists for not accommodating the migrant hordes. In the following videos, you will see neighborhoods filled with the acrid smoke of burning and overturned cars, with thousands of protesters in yellow jackets demanding that Emmanuel Macron step down as President of France. 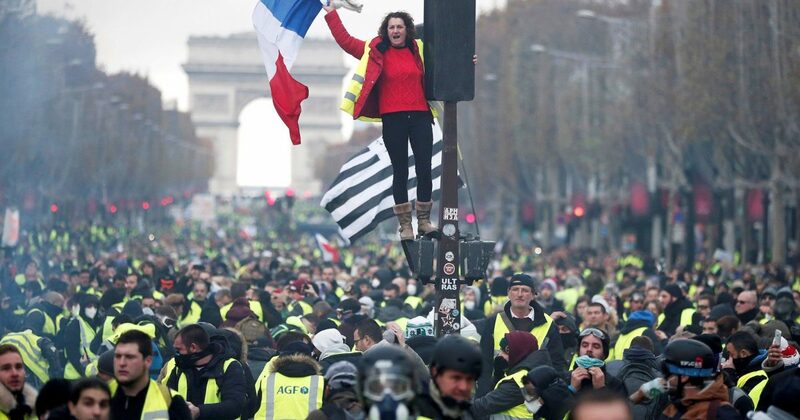 The people of Paris have had enough of government oppression. Unable to survive on their wages, overburdened by taxes to pay for social welfare, and now with fuel prices leaving them unable to pay their bills, they are doing the only thing left they can do, protesting against their government. While the Yellow Jackets insist that their protest is peaceful, their actions belie that. Peaceful protesters do not overturn cars and start fires in the street, nor do they destroy private and public property. It is, however, unlikely that they would get the government’s and media’s attention any other way. That's the treatment french people get. Invaders get greeting cards.